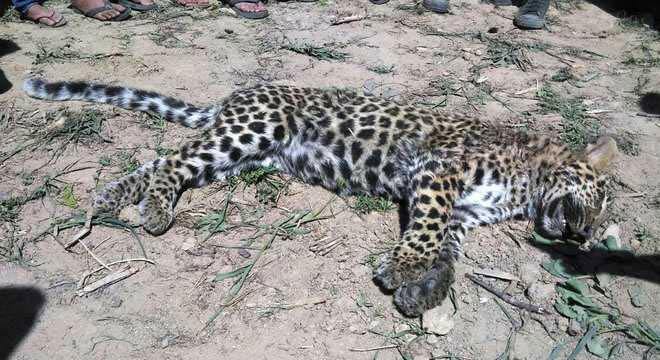 A leopard was found dead near Dari village yesterday. A woman found the carcass in a field and raised an alarm. Villagers gathered at the spot and informed the police and forest officials. Forest officials arrived soon and took the animal’s body for a postmortem examination to ascertain the actual cause of the death. The death of another leopard within a week in Mandi has raised serious concerns about the existence of the rare species. On March 22, a leopard’s hide was found at an isolated place in the forest area near Khajoor village in Ladbhadol area of the district by a group of villagers. The head, tail and legs of animal had been chopped off, indicating the prevalence of organised poaching in the district. Confirming the death of the animal, Conservator of Forest Department, Mandi, RS Patiyal said poaching could not be ruled out as a reason of the death. However, the reasons would be ascertained after the receipt of the postmortem report, which is awaited. “Preliminary inquiry revealed that the leopard had a deep injury on its throat and we have lodged an FIR under the Indian Wildlife Protection Act,” he stated. After getting the postmortem report, the further course of action will be decided.